"All colors agree in the dark." 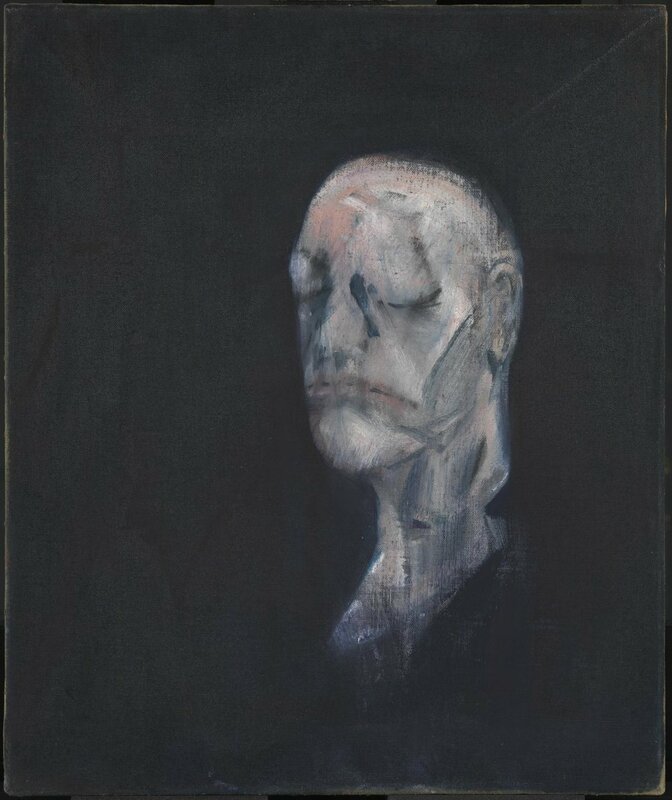 Kahneman's neuroscientific perspective on unhappiness is undeniably modern [2,3] but the importance of unhappiness in society has been underscored for millennia by artists and philosophers. More than two thousand years before hedonic psychology, Aristotle discussed the nature of tragedy in Poetics. The emotionally 'unhappy' elements of a tragedy ("passions," as termed by Aristotle) were reduced to just two: fear and pity. Aristotle argued  that improper tragedies invited destructive conclusions, where fearless pity bred compassionate inaction and pitiless fear constituted desensitizing horror. Avoiding these pitfalls – a proper tragedy could cathartically relieve the audience of their passions. Listen to Vedantam's interview with Kahneman on the NPR website. "The New Science of Happiness." Time. January 2005. Well-Being: Foundations of Hedonic Psychology. Kahneman, Diener, Schwarz. For more on these ideas, read "The Character of Tragedy." A sidenote: Aristotle's two works discussing aesthetics (art-centric philosophy), Rhetoric and Poetics, form an interesting parallel to Kahneman's work in behavioral economics that garnered him the 2002 Nobel Prize in Economic Sciences. Just as Rhetoric depends on rationality, economists prior to Kahneman relied on rational choice theory, which models independent economic actors (consumers, like you and me) as rational agents, who weigh their available choices and make a logical selection. Kahneman embraced fallibility to form the concept of an irrational economic agent who operates using heuristics (which might be passion-driven, faulty, or even tragic). In a fantastic piece for the digital magazine Aeon,  professor Adam Roberts quotes from an 1823 essay: "All men of genius are melancholy – and none more so than those whose genius is comic." The title of this essay, "Atrabilious Reflections upon Melancholy," refers to the state of atrabiliousness, from (unsurprisingly) the Greek atra bilis ("black bile"), a holdover from Hippocratic humoralism and a nod to early scientific explanations for unhappiness. Modern medicine may have replaced atrabiliousness with abnormal psychology, but the melancholy of men of comic genius has only become more pronounced with time. Without going into too much detail, briefly consider the lives of Robin Williams, John Belushi, Chris Farley, Phil Hartman, Bill Hicks;  name a comedian, and you’re likely to find a tragedy. Moreover, studies have shown higher incidences of disease in comics and an average lifespan nearly a decade shorter than that of people in the Armed Forces. The reality that tragedy befalls comedians more than members of the general population might even be an indicator that the tragedy doesn't befall them at all – it begets them. This is not to say we should collectively focus on the psychology of comedians, or that unhappiness and tragedy are especially limited to fine arts or social sciences. In fact, unhappiness is as prevalent as ever and gaining in popularity. New technologies and new modes of communication are invented daily, and with them come new variants of unhappiness. Gilgamesh as a tragic hero. "Why the long face?" Aeon. March 2014. "The Tragic Side to Comedy." Huffington Post. May 2013. "The Dark Psychology of Being a Good Comedian." The Atlantic. February 2014. 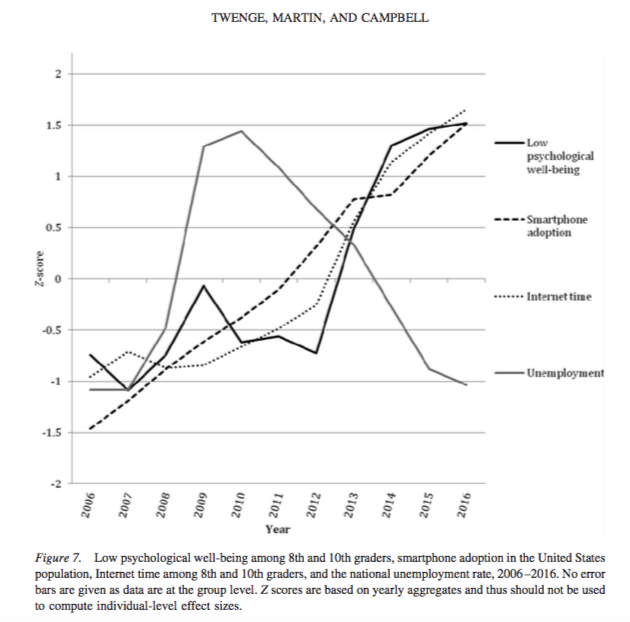 Take, for example, smartphone use: Since the advent of the iPhone in 2007 (and the Razr before it, in 2004), research (left) has shown a strong correlation between low psychological well-being, smartphone adoption, and internet time (while specifically indicating that unemployment rates didn't affect these trends outside of depressing the smartphone market). This study focused on young people – high-schoolers, since they're easier to access (from a research perspective) before they've ever had a smartphone – but the results aren't hard to extrapolate to older people. Another study (here) mentions that this increasing unhappiness is relatively new, mirroring the rise of internet-based communication: "Mature adults’ age advantage over adolescents in happiness has dwindled, and the once reliable positive correlation between age and happiness among adults has disappeared, reaching zero in the early 2010s." "The Art of Unhappiness." Time. January 2005. "We need art to tell us, as religion once did, Memento mori: remember that you will die, that everything ends, and that happiness comes not in denying this but in living with it." Maybe tragic art will teach us how to be happy, but scientific research might explain unhappiness first. One hedonic psychology study discusses the quantifiable fixation on social comparison that unhappy people show,  reminding us that increased social media use may not yield the benefits of more frequent digital interaction with peers and friends. Kahneman's work continues, too: Objective happiness research has generated real-world results (hilariously, one of his studies improved the perceived unpleasantness of colonoscopies). Regardless, if we're really getting unhappier as a species, it's worth our time to understand what can be gleaned from something so universal. "Hedonic Consequences of Social Comparison: A Contrast of Happy and Unhappy People." Journal of Personality and Social Psychology. Lyubomirsky & Ross. 1997. "There will be peaks of great joy from which to crow and vales of tears out of which to climb. When and why they will happen, no one can say, but they will happen. To all of us. We will all go back and forth from one to the other countless times during a lifetime. This is not some call to bipartisanship between inimical sides. The Happy and the Sad are the same population."